The Lincoln Trail ride is supposed to be in the central Ill area. Well, it seems that the State of IL does not have funds to make use of the parks in a full manner. So, the endurance race/ride was moved to Salem IL. Sandy wanted to take Blues, my “best horse” to a horse camp for a lady’s trip the next week so Blues was out as far as a competitive 50 was concerned . I wanted to try Rebel in the 100 mile event, which neither of us had ever down before, but he was sold to a new owner in Arizona. So, that left me with some interesting choices. I offered my friend Jeff Anderson, who had never attended a ride, the chance to ride Blues in a medium paced 30 Ld as a buddy to Jazz. Jazz is a spirited 4 year old registered TWH that we have owned and trained since she was a weanling. Unlike every other horse I have ever trained, Jazz was not “broken” or “gentled”. She and I reached a kind of truce. I planned to ride her at about 7-7.5 mph and Blues would have to ride down to her heart rate. We would of course also monitor Blue’s heart rate during the event. I also took Kate, my favorite little 5 year old TWH mare. Both horses are petite and neither top 14.3. Jazz is jet black with a blaze and Kate is a grey with silver main and tail. Jazz has a completely square 4 beat gait and starts to get rough over 9 mph. Kate tops out about 11.5 mph. She is my lap dog. She has had over 400 miles of training this year and this would be here 4rth LD. Jazz is an alpha female and Kate is at the bottom of the mare heard. It is probably one of the reasons that Kate has bonded so much with me. All three horses passed vet in with straight A’s, and even got A’s for the “trot out”. I put them all in the electric pen and went to bed. At 1:30 a neighbor in the camp woke me up with words we all dread to hear: “Keith, your horses are out!” Jazz had run Kate through the electric tape. We caught the horses and put the pen back up. At three a.m., It happened again. This time I tied Kate to the trailer. The warm up is always interesting at these events. The Arabians are often keyed up and the excitement of the early start shows in both the riders and the horses. With all the trotting and posting going on, our gaited horses sometimes don’t really know what to think. Of course Blues, Lady and Rebel understand as they are experienced. I realized during the warm up that Jazz had never been around any trotting horses, let alone several of them. This was going to be interesting. The race director said, “the trail is open” and off we went. We settled in around mid pack and I had Jeff set the tempo at about 7 mph. This is barely moving for Blues as his 50 mile pace is 10-12 mph. I wanted a smooth, calm buddy for Jazz. We were less than a mile into the start and two arabians came up behind us moving quickly. It startled Jazz and she jumped to the left with all four feet, hit the ground, popped up on her rear legs and then bounced again to the left. I was glad I had not ridden my english saddle. I calmed her down, let the arabians go on past and off we went. We settled in with Joslyn Seedeldt who was riding a lovely Paso Fino. The horse fit in well with our pace and I was glad to make a new friend. We held a steady 7 -7.5 mile average for the first 15 mile loop with out mishap. All the horses in our immediate group drank well and we took a small munching break for some tasty grass a few miles from the vet check to help with gut sounds. Having a gps watch, as well as knowing the course is invaluable. I stopped about 500 yards from the vet check and got off and walked. We dropped our saddles at our rig and walked into the vet check. Blues and Jazz both went through the vet check without issues and went back to the trailer for hay, carrots, apples and my mixed electrolyte and apple sauce mix. The second 15 mile lap was a mirror image of the first. The exception was that Jazz did not see the need for any side ways shennagins. Blues kept asking to go but Jeff held him back per my instructions. We finished in a pack of 4 horses in 5th, 6th, 7th and 8th positions. To my surprise, Jazz’s heart rate dropped almost immediately and she finished 5th and Blues was 7th. Jeff Anderson chose not to put up his tent and instead sleep on a cart near the electric pen. He woke up once Saturday night with Jazz sniffing him. She had gone through the pen. This thing was just not working correctly. I woke up Sunday morning pre dawn to get Kate ready for her 30 miler. Kate was tied to the trauker, Blues was in the pen looking out in the distance and Jazz was no where to be seen. One section of the fence was leaning out a bit. Jazz had jumped the fence. Blues is “proud cut” and thinks he is a stud. Yes, he does try to “service” the mares. He also tries to always watch out from them. He makes a great baby sitter horse to boot. He was standing rock still and staring out into the darkness in the direction of a field with very high weeds. I followed his gaze into the field and thought I saw a dark shape in the distance. I called her name and the shape moved and came across the field towards me. I opened the corral and she walked in. There was no telling how long she had been out in that field. I warmed up Kate and Jeff agreed to dismantle the electric pen and try to fix it. The trail was opened and Kate and the lead arabian went to the front. 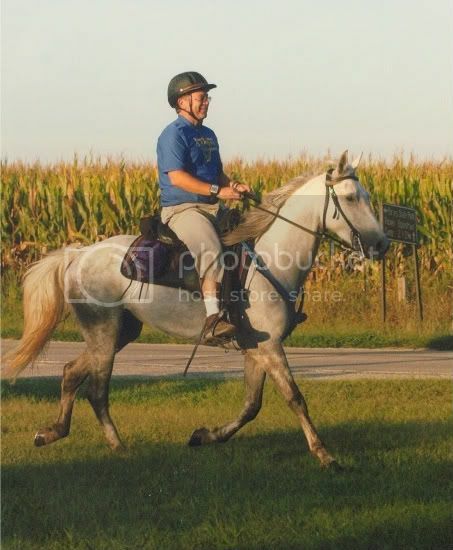 Paula Kaigh is one of the top endurance riders in the midwest. She won the 50 mile event on her other horse the day before. We had been in the lead together at the Sedalia MO the year before in the 50. This woman knew how to compete and had good horses. Kate was going to have her hands full. We rode together for the next 15 miles and had a lovely time together. Kate’s heart rate was running about 125 most of the time. We averaged around 9 mph. Did I mention that I love this little horse. Her personality makes her my sweetheart horse. She wants to be with me and she wants to please me. Her “motor” is like a fine tuned honda. It won’t out pull a corvette in a drag race but will keep its rpms low and be very dependable. We pulled into the camp on foot, I dropped my saddle at our rig and walked to the vet check barely in first place. The arabian dropped immediately to 6o. Kate stayed up around 70 for two minutes. It was hot and humid. I have found that Kate’s heart rate will drop if you move her a few steps. I moved her about 10 feet into some shade and she dropped into the 50’s. Paula had a three minute head start on me and said she would be looking for me as she left the start line. The next three minutes seemed like 10 minutes. I collected Kate up and told her to “come up!”. That is the phrase I taught her to mean, “it’s time to rack on”. She did just that. I caught sight of the leading arabian and used me running watch to figure out how far behind we were. We made up 45 seconds in the first 2 miles by my figuring. Then, the leader disappeared. Kate was moving as fast I dared rack her without raising her heart rate higher higher than I wanted. We were racking along at 11.5 mph. I wondered if there was a chance the leader had gotten off trail. Maybe she needed to find a convenient tree. Should I slow down and trust that she had pulled off the course? Was Kate in the lead? My imagination went into overdrive. I decided that she was still in front of me and I would keep Kate in her ground covering little rack and keep my eye on Kate’s heart rate monitor. We ran them down around 4.5 miles into the lap. Paula did not seem overjoyed to see us so soon. I pulled our pace back just a bit for about 800 meters and then pulled Kate into the lead and bumped up her rack. Paula and Dhelall picked us their pace right along with us. We continued for a few miles like this until the next creek. Both horses drank and then we were off again. Kate pulled into the lead and Dhelall snugged up behind us. I backed the pace down a little and tried to think of a strategy. 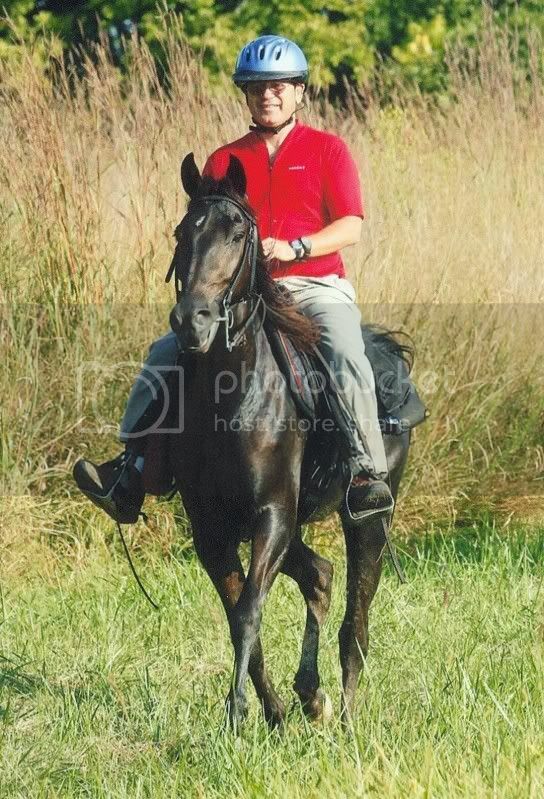 One of the advantages that our gaited horses have is that they are extremely stable in bad footing and on down hills. Under 7 mph they are in the running walk and have three feet on the ground while they are moving. Over 7 mph and they still have one foot on the ground. Kate was faster down hill than the trotting arabian. We had down hills coming up. On four different occasions Kate pulled ahead with her sweet little rack on a down hill only to have the arabian’s gallop pull us back. I decided we simply could not out rack the arabian’s gallop. We would have to take our chance at the finish line. Jeff met me at our rig. I dropped the saddle, threw an electrolyte down Kate and walked towards the vet check. Jeff sponged while we walked. We hit the vet check timer first but only by about 10 feet. The arabians heart rate his 60 almost immediately. It took Kate another 3 minutes in the heat and humidity. We had an hour until B.C. I had brought show sheen and other products to try and slick Kate up for a potential B.C. try. I tried to put her proverbial “best foot forward” and Jeff left for home. Kate did well at the B.C. vet check. Then I got ready for the dreaded “trot out”. Suddenly, the vet asked me to trot Kate out in a circle and then reverse the circle and trot her out on a loose lead on a reverse circle. I gulped. I had not practiced this with Kate. I used my authoritative voice and said “Kate, come up!” and started off in a circular jog. Kate paced right along a step behind. I dared not to look at her. We reversed the circle and barked again. Kate never hesitated. She won B.C. by over a 100 points with a total of 737 out of a possible point total of 800. It was a wonderful ending to a great weekend. Jazz had done fantastic at her first event. Kate won B.C. and the vet said she was about ready for a 50. 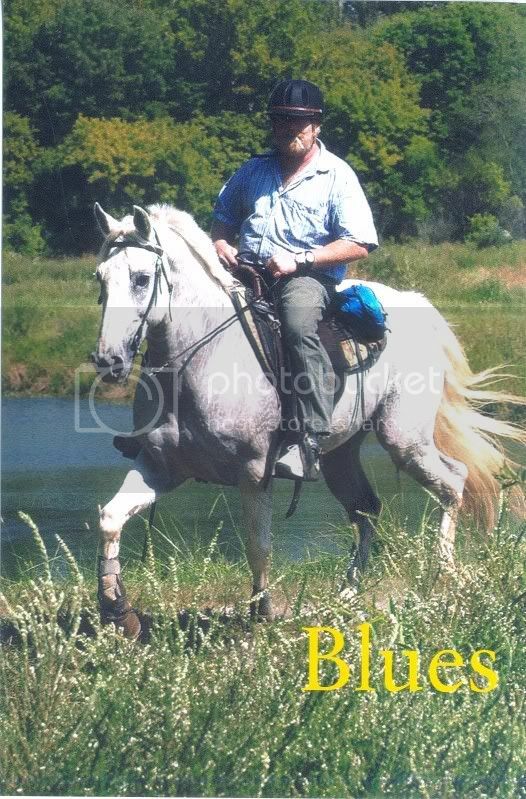 Blues had calmly added to his mileage and my friend Jeff Anderson had finished his first ride. Life is good! This entry was posted in Endurance Races and tagged Endurance Races, Lincoln Trail. Bookmark the permalink. Copyright © 2011 Shawnee Sunrise Farms. All rights reserved.